It has been a long six and a half years since the Arab Spring, the popular movement of early 2011 that toppled dictators and challenged regimes across the Middle East. While Tunisia, Libya, and Egypt have since then followed different political paths trending either upwards, flat, or downwards respectively, Syria has virtually fallen off a cliff. Over six years of constant war between four major belligerents have left the country with perhaps half a million dead and at least two thirds of its people displaced. The formation of Daesh created a new terroristic boogey-man for Westerners that somehow distracted from the consistently cruel inhumanity of the Assad regime. Meanwhile, the worst refugee crisis since World War II continues unabated. 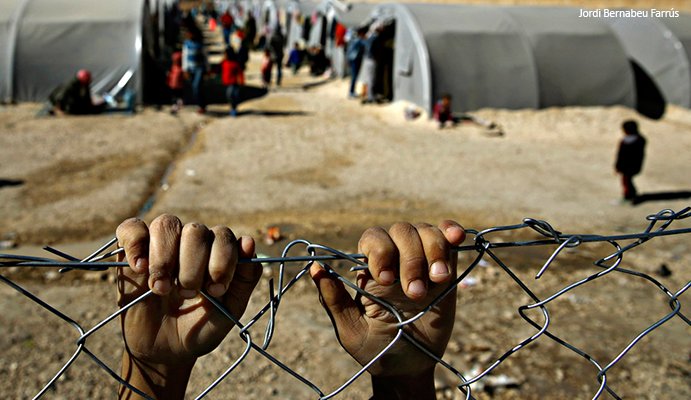 The neighbors of Syria–Turkey, Jordan, Lebanon, and Iraq–have taken in most of the refugees. The paltry number of victims that have made it into Europe or North America has prompted a xenophobic and Islamophobic backlash resulting in a resurgence of far-right parties. In such a world of hard-heartedness, it is often art that helps us rise above the quotidian news mill and find shelter in stories of compassion, love, and our shared humanity. Two new novels by two very different authors have attempted to tell the stories about Syria and its refugees that we need to hear: Exit West by Mohsin Hamid, and Dark at the Crossing by Elliot Ackerman. As the fighting escalates, there are rumors of doors around the city that transport you to other places, the kind of desperate superstition that takes hold when true hope for a reprieve is nearly lost. Eventually, Saeed and Nadia decide to pay an agent to lead them to one of these doors; they give him their money and don’t hear back from him for weeks, the victims of con artist. Until he does actually call back and lead them to an bombed out dental clinic with a pitch-black opening where the supply closet should be. They both walk through this portal and find themselves on a beach in Mykonos, Greece. The reader also suddenly finds herself in a new type of book that is no longer realistic narrative but Borgesian speculative fiction. It reminds me of last year’s Booker Prize winner The Sellout, by Paul Beatty (my review here), in which straight-forward story of slave plantation brutality opened up to a literal Underground Railroad in which the characters ride from state to state. In Exit West Hamid has created a convincing and uplifting portrait of what the world could become if humans evolve ever so slightly out of their instinctive tribalism. The author is in fact an avowed optimist with an interesting biography, which he discusses in his collection of personal and political essays called Discontent and Its Civilizations. The titles of some of these essays include “When Updike Saved Me from Morrison (and Myself)”, “Get Fit with Haruki Murakami”, “Nationalism Should Retire at Sixty-Five”, and “Why Drones Don’t Help”. The relatively sanguine attitude he conveys in this quote, for example the picture he presents of modern Pakistan, is indeed a refreshing view in an increasingly unoptimistic world: “But if globalization is capable of holding out any fundamental promise to us, any temptation to go along with its havoc, then surely that promise ought to be this: we will be more free to invent ourselves. In that country, this city, in Lahore, in New York, in London, that factory, this office, in those clothes, that occupation, in wherever it is we long for, we will be liberated to be what we choose to be.” He is also the author of a gripping, enigmatic novella called The Reluctant Fundamentalist, which I highly recommend and which can be read in a few hours (and has even been made into a film that I have not yet seen). Elliot Ackerman’s second novel, Dark at the Crossing, is shortlisted for the National Book Award. It is the story of Haris Abadi, an Iraqi former interpreter who wants to cross the Turkish border to fight in Syria. Haris gained American citizenship in return for services rendered from years of loyally working with Special Forces in Iraq (a plausible but unlikely occurrence in real-life). He was able to bring his sister along to his new life in Michigan, but he loses a sense of purpose for his own life after she gets engaged and he does not have to support her studies anymore. He travels to south-eastern Turkey to fight for a cause in Syria. It turns out that neither he nor the readers ever get a strong sense of what exactly that cause is. A large part of the narrative involves waiting in Turkey trying to cross the border, and flashbacks to his time working with SF. The only American character (other than the naturalized protagonist) was one of the SF team members named Jim, who seemed to be a stand-in for the muscle-bound, arrogant, secretly sensitive, not-as-smart-as-he-thinks American soldier trope. This is similar to Ackerman’s previous novel, Green on Blue, in which a mysterious CIA operator known as Mr. Jack is the only American among a cast of Afghans. In flashback scenes, we see Jim involve himself again and again in Haris the interpreter’s life, including drunk midnight confessionals in his tent. Jim obviously meets an untimely death, and the guilt Haris harbors is part of the reason for his quest. During the long period of waiting to cross the border, Haris is taken in by a Syrian refugee couple, Amir and Daphne. Educated and sophisticated, they were among the first revolutionary protesters before the civil war started. Now their lives and relationship is stuck in place as Amir wants to move West and start a new life, but Daphne cannot abandon the dead daughter she thinks is still alive in their old village. As Haris becomes entwined with these two and other seedier characters, an opening is found to enter Syria, and their journey together continues inexorably, bewitchingly towards its destined climax. Ackerman was a Marine Corps officer for eight years, serving multiple tours of duty in Afghanistan and Iraq. His first novel, Green on Blue (review in The Wrath-Bearing Tree here), was a remarkable tale of an Afghan boy’s gradual rise through the ranks of militancy in War on Terror-era Waziristan. In fact, it was riveting reading for me because it is set exactly in the Afghan province of Paktika in which I also spent two years deployed to Forward Operating Bases, specifically around Bermel, Shkin, Gomal, and Orgun. Ackerman has also published a short story in the veteran’s anthology The Road Ahead (to which I am also a contributor), and now lives in Turkey. One of the greatest benefits of literature is that it can build empathy for people whose lives you could not previously imagine (a theme I discussed in my essay Why Black Literature Matters). I have visited the western part of Turkey, but never the eastern borders of Syria and Iraq, nor have I personally met any Syrians or Iraqis. The only Syrian characters I have previously encountered in my reading are the types of conniving, cultured, expatriot merchants that occasionally dot the pages of a Conrad, Durrell, Naipaul, or Greene. With their characters and their stories that let the reader experience the lives of others, Hamid and Ackerman, like all great authors, show how ultimately we all share the same hopes and fears, and that our humanity defines us more than our nationality.